Americas Cardroom – OSS Cub3d $5.7 Million Guaranteed April 9th to May 7th! $5.7 Million GTD on Americas Cardroom from April 9th to May 7th! We at Americas Cardroom have always pushed the envelope on the prize pool guarantees of our tournament series. This is why our second-ever OSS Cub3d will guarantee over $1.2 million more than our inaugural event last summer. That $4.5 million GTD OSS Cub3d last year had a pretty huge turnout. So much so, we ended up paying out over $6.5 million throughout the event. So we’re back with our first series offering of 2017, and we’re going big. It’s four weeks of non-stop tournament action, made up of three back-to-back-to-back tournament series. Click here to sign up to Americas Cardroom. Register with bonus code GPSTSOSS and receive the maximum welcome bonus – 100% match bonus, up to $1,000, + 20 days of Free Cash up to $50 and entries into the $250 New Depositor Freeroll! 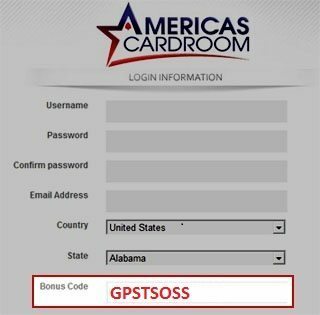 You can find more details about the Americas Card Room welcome bonus code offer here. We’re getting our feet wet through 47 events with micro and small stakes buy-ins starting as low as $0.06. That isn’t to say the prize pools aren’t impressive. The series Main Event has a $200,000 prize pool with an entry fee of just $88. Now we’re cooking. The OSS offers a variety of huge prize pool events with buy-ins ranging from small to big. It’s capped off with a $1,000,000 GTD Million Dollar Sunday Main Event. This will be the 11th time we’ve hosted an event this size on our network. Fancy yourself a BOSS? This 5-day series isn’t for the faint of heart (or bankroll). With buy-ins ranging from $109 all the way up to $5,100 (you read that right), players are in store for some big prize pool tourneys with small fields. We’ve designed a huge satellite schedule so everybody gets a chance to get in on the action. In total there are 141 events and each one matters more than you think. The three series have a combined leaderboard where players accumulate points based on tourney finish, buy-in amount, and number of entrants. The three players with the most points when it’s all over win $4,900 packages to the 2017 Punta Cana Poker Classic this October. Finally, we’re throwing in six engraved OSS Cub3d sterling silver bracelets. The Main Event Winners each get one, along with the three players headed to Punta Cana. No matter what your schedule is, 4 weeks of non-stop action gives you lots of opportunity to get some tourneys in. Check out the full schedule here to pick which events you want to play. Players receive points for every OSS Cub3d event played based upon several components. Points are tallied from an equation that accounts for a player’s finishing position, total number of entrants, and the entry cost factor. Sit & Go 2.0 is now live exclusively on Americas Cardroom. Each game dealt offers potentially bigger prize pools, more paid spots, and a shot at a progressive jackpot! Click here to sign up to Americas Cardroom!